Are the classics always the best? That’s certainly what some people think when it comes to playing great casino slots like Diamond Strike. They love all of the traditional styles and gameplay so much that they keep on returning to all of the latest games that remind them of the ones they used to play. So, if you are a sucker for the old school, then you will definitely love Diamond Strike. Hurry up and play slots online at this link. Pragmatic Play has created a game with traditional values but a lot of unbeatable modern graphics! Don't forget to check out more of the games by Pragmatic Play at WS. Known as being one of the biggest movers and shakers currently working in the casino slot game industry, Pragmatic Play has been responsible for some of the most popular games over the past few years. The company’s trademark slick animations and compelling graphics are all here for you to see. Can’t get enough of Diamond Strike? You might also want to try Joker’s Jewels and Lucky New Year now on. Diamond Strike couldn’t be any simpler to play and you will find that it’s easy to get the hang of it, especially if you are already a dab hand at traditional slots. The game board is very easy to figure out as there are five very clear reels against an electric blue background. The game’s title is right at the top of the board in a very 80s-inspired font with a couple of lightning bolts striking it on either side. Get started and play the best slots in UK today! 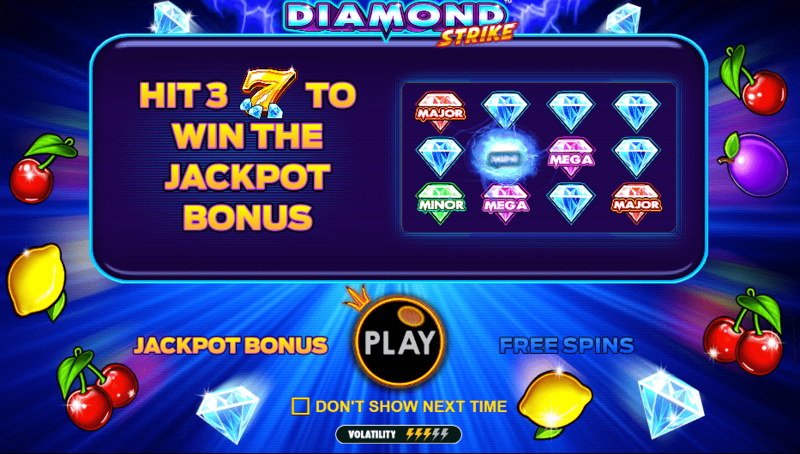 There are fifteen pay lines on the reels of Diamond Strike, so you should get plenty of chance to line up some winning symbols! When it comes to the choice of symbols and icons on the board, there is nothing too surprising here. It’s all the usual fruits that you would expect to see on traditional slot machines: cherries, watermelons and lemons. Pragmatic Play has given them a 21st-century makeover, though, and they look very striking. But it’s not just a fruity board – there are some other symbols that you can spin to win bigger prizes. WILD SYMBOL – Keep an eye out for the Diamond Strike symbol as this is the game’s Wild. These Wilds can help you win more as they can take the place of any non-bonus symbol. SCATTER SYMBOL – The Scatter symbol is very easy to spot when it is on the board as it very clearly says “Free Spins”. And that is exactly what you will get with it! In order to benefit from the Scatter, you need to land three of them on the first, third and fifth reel at any one time. 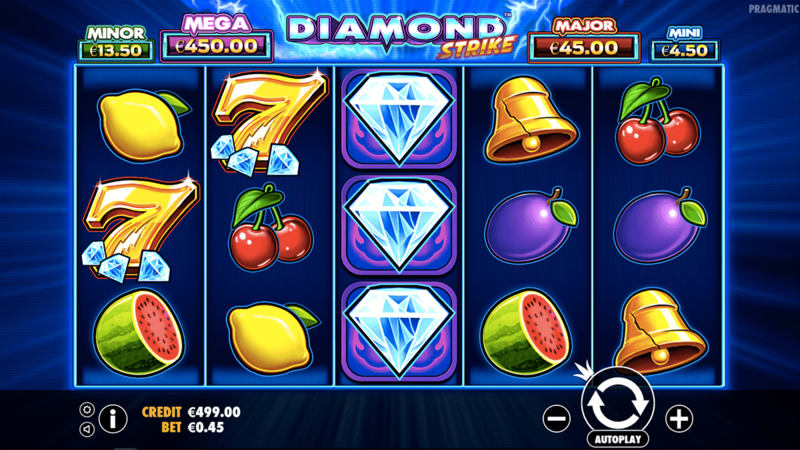 If you have been looking for a good old traditional slot game, then you might be surprised by Diamond Strike. It’s a traditional game at heart but has all the fancy graphics and game design that many state-of-the-art games come with. Even if you aren’t specifically after a traditional game, you will still have a lot of fun thanks to its enjoyable bonus symbols and frequency of big wins. If you enjoyed Diamond Strike why not try Gold Rush!